Captain Henderson, one of the marines came to us and said we had six months pay due us, and if we would go out in the Constitution we should have the six months pay & a run on shore. We volunteered, had our frolic and sailed in “Old iron sides” and cruised all over the world_ Fell in with, and passed the English frigate La Peak, it was quite calm . She under short sail waiting for us to come down. All hands were called to reef topsails by Lieut. Ballard, in so doing we lost the little head way we had, and swung round, and as soon as they saw our broadside, they made sail and stood away as fast as the light air would allow. Before we could shake out the reefs and make sail- She caught the land breeze. It being evening, we lost sight of her, in the haze, and at the same time lost our fortunes, as she was loaded with money and stores for Quebeck. We cruised round some time, until we ran in off Portsmouth (N.H.) and laid by that night & the following, and as soon as the fog lifted we discovered two English frigates  = They gave chase and drove us into Marblehead, and were blockaded one week, one day they drifted some distance to seaward, and there being a fine breeze Commodore Stewart said “we will show those fellows our heels” but he wanted everything that was done to be done in a croak, so underweigh we got and slipped out. They gave chase, but we got safely into Boston. We then steered for Madeira -on the cruise took a ship loaded with hides and tallow  and drove two English privateers into Funchal. This being early in the morning stood out to sea again, made a large sail and stood for her, and found she was making signals _ whereupon, we pressed on sail and cleared ship for action, sanded down the decks, and finding there were two, crowded on in chase- At dark, the battle lanterns were lit, and we tried our bow chasers and received a supply from the Stern guns. The first two shots from us, cut away the wheel, and kill[ed] the men stationed there. Then they both bore down on us. The “Cyane” on our port quarter and the “Levant” on our port bow. Comr. Stewart was sitting astride the hammock netting giving his orders. They took up their station so we could not bring any of our amidships guns to bear. So we engaged them with our forward and after guns. The marines in the Waist. We were giving it to them by the flash. Comr. Stewart was giving all the directions about the management of the vessel as the enemy were trying in every way to rake us. The action went on for forty minutes, and we heard a hail from the Cyane saying “she had struck and we had killed all his men.” The Levant at this time had forged ahead to repair damages. We were employed in taking possession of the Levant when the Cyane bore down and gave us a broadside in our bow. Then Commodore Stewart said to Mr Ballard the first Lieut. “give that fellow a division and [see] if it does not sicken him,” Sent him the division, which did the business. 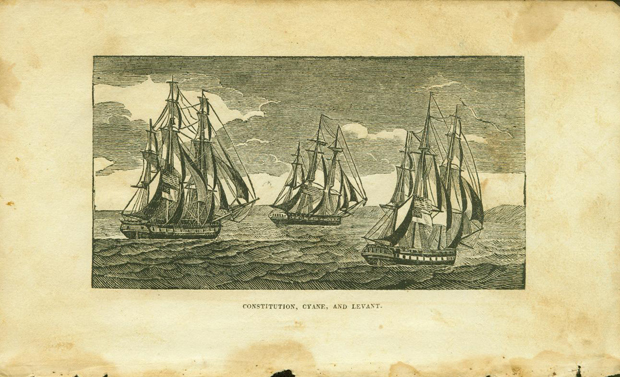 “View of the action between the US Frigate Constitution & the British Ships Levant & Cyane,” from Abel Bowen’s The Naval Monument, 1816. USS Constitution Museum collection. I lent a hand to haul his colors in from the water. We were employed all night pumping and the carpenters putting in plugs. The shot passed entirely through her just above the berth-deck. I know this to be the case, as I was one of the first on board the Levant, old Sergeant Rath selected me, as I said, “Boys that is my ship,” and also McDonald and Levi Butler, there being only three marines for each ship. Lieut Shubrick was placed in command after we had repaired damages . Constitution carrying her prizes to Porto Praya, from Abel Bowen’s The Naval Monument, 1816. USS Constitution Museum collection. We entered the harbor, and Lieut Ballard was sent for by Sir Geo. Collier the Comr. of the Squadron to take his men on shore, as they were no longer prisoners. By special request of our commander, we were allowed to go on board a hulk in the harbor, and remained there until we left in a schooner for Baltimore, and on our arrival, men all transferred to the Erie sloop of war & sailed in her for New York and on our arrival found the Constitution had been in three days, and as we passed her, we of the old crew gave three cheers for the old Constitution. Then Comr. Stewart hailed, asking what men were those & [said] I want them all. Open a house on shore and ship here, I must pay those men their prize money and pay them off, leaving only a handful of men on board the Erie. We took her in tow and sailed for Boston, but one of the men cut the tow line, and she did not arrive until three days after us. Private Joslin’s association with Constitution ended when he and the rest of the crew were “paid off” in July 1815. He spent three months living on his pay and prize money, but soon decided that civilian life was not for him. Naval Asylum and I am well situated and satisfied. Despite an eventful and strenuous life, Joslin lived for another twenty years. He finally succumbed to adynamia brought about by a series of debilitating illnesses on July 20, 1864 and was buried at Mt. Moriah Cemetery in Philadelphia. Constitution encountered HMS Pique (36, captured from the French in 1800) on the morning of February 23, 1814 in the Mona Passage, east of Puerto Rico. 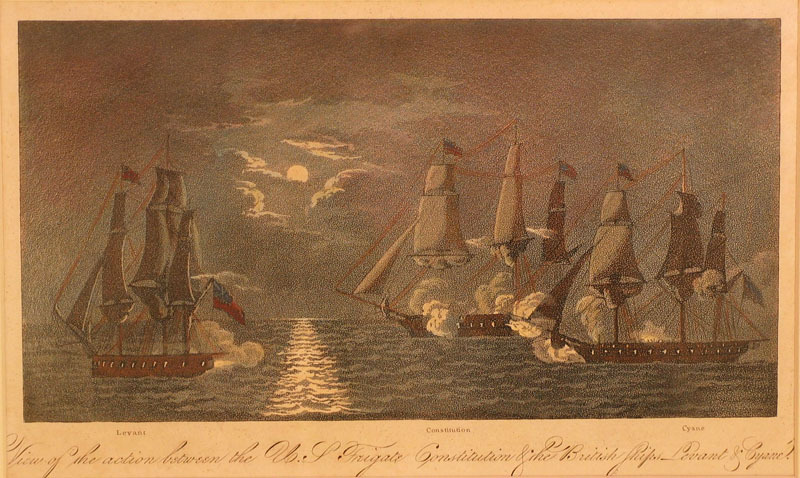 HMS Tenedos and HMS Junon (both 38-gun frigates) chased Constitution into Marblehead on April 3, 1814. Joslin compressed the chronology of events. HMS Newcastle and HMS Acasta joined Leander off Boston in the fall of 1814. Constitution slipped through the blockade on December 18. The Americans captured the schooner Lord Nelson on December 24, 1814. The ship Susan or Susanna fell prey to Constitution on February 16, 1815. She carried a cargo of tallow, hides, and furs worth $75,000. In truth, Lt. Beekman Hoffman took command of Cyane and Lt. Henry Ballard commanded Levant. The island of Maio, part of the Cape Verdes. “General Henderson,” was Archibald Henderson, commandant of the Marine Corps. As a captain, he had commanded Constitution’s Marine guard in 1814-1815.